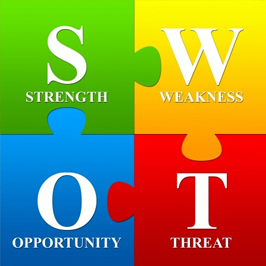 SWOT stands for Strengths, Weaknesses, Opportunities and Threats. Here are definitions of each one of these items in greater detail. Strengths: characteristics of your law firm that give it an advantage over others –what are the reasons the firm is chosen to represent clients? Weaknesses: characteristics that place your firm at a disadvantage relative to others – what has caused you to lose business to your competition? Opportunities: elements that your communications team could exploit to its advantage – what impending changes in the law could affect your business? Threats: elements in the environment that could cause problems for your firm’s business – who is your competition and what are they doing differently from you? A SWOT analysis is widely used in strategic planning and can be a powerful tool in assessing your current communications program, as well as your firm’s relative position in the market. The process is most effective when you have defined the problem or concern that has to be addressed and, ideally, developed your goal statement or intended end state for the project. For instance, the problem may be lack of awareness of the firm’s core practice group or groups among prospective clients. The goal would be to raise awareness among prospective clients by targeting key industries through the firm’s communications program. Here are some tips to help you get the most out of your SWOT analysis. Before you begin your SWOT analysis, select a cross-functional team of six to eight people who can provide a range of perspectives, especially people from areas relevant to the issue or problem for which you are preparing a communications plan. You should include people who are broadly familiar with your communications program or group, such as people from your marketing committee and your public relations firm, heads of the practice groups you promote, etc. SWOT analysis is simple in principle, so there’s no need to overcomplicate the process. However, as you compile your list of SWOTs, you should give deep consideration to how these attributes affect achieving your goal. When considering your SWOTs, it may help to step out of yourself and view your law firm from your clients’ perspective. What would clients say is your biggest weakness or your greatest strength? It seems to be a fact of business that resources are always limited. You probably can’t afford to follow up on every SWOT item, so it’s necessary to attend to the most important first. I recommend prioritizing the SWOT factors. You can choose how you define priority, such as by urgency, strategic advantage, cost, etc. Everyone knows they have strengths, weakness, opportunities and threats, but sitting down to identify them and assess their priority helps with the future steps of your marketing plan. Although SWOT factors may always lurk in the back of your mind, writing them down and addressing them over time will help you feel in control. Need help with your SWOT analysis? Contact me, Carlos Arcos at carcos@jaffepr.com.